Veduta™ is the innovative, intuitive and unique means to view complex system logs, behaviour of inter-related systems and trends with one screen of data. New! 1.1 release available now! Veduta now features search engine capabilities and dynamic report interrogation to help you determine problems and behaviours intelligently, intuitively and accurately. Launch a demo right now, or download a trial version today!. 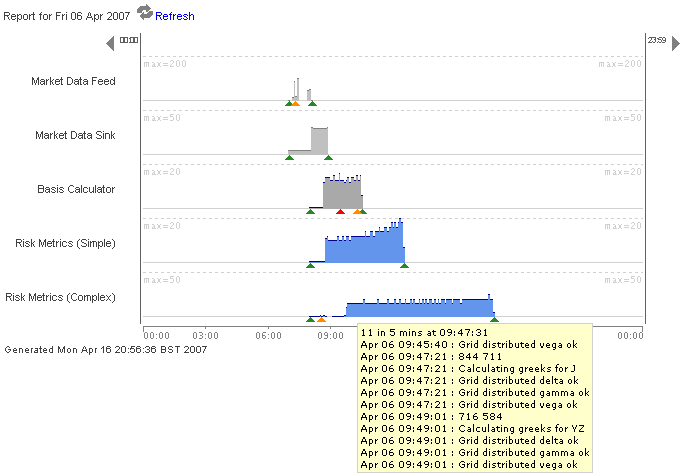 Traditional log viewers show you the detail in each log file - Veduta™ shows you the complete system state at a glance. See how it works! without the need for searching and correlating complex system logs. All the information is available in one picture, on one page. No grepping, no searching for logs across different servers, no paging through multi-megabyte log files. Download a trial edition of Veduta™ now (complete with examples ready to use), and see examples for ideas on how Veduta™ can help you in faster and more useful system diagnosis. Veduta is a trademark of OOPS Consultancy Ltd. Java and all Java-based marks are trademarks or registered trademarks of Sun Microsystems, Inc. in the U.S. and other countries. Copyright© 2007 OOPS Consultancy Ltd.